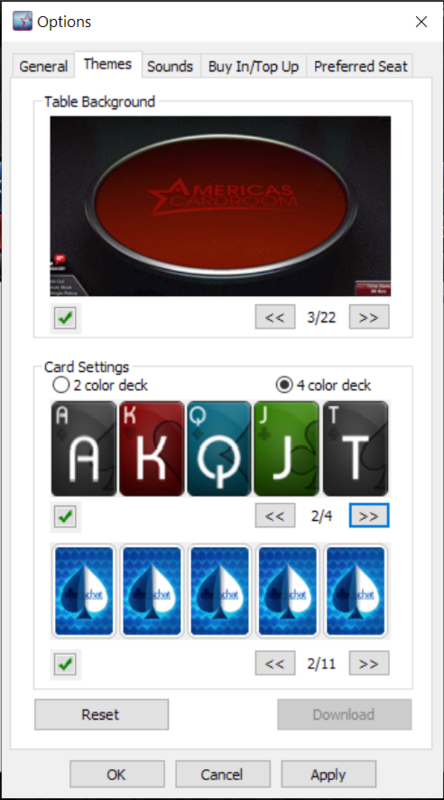 I have made some Cardschat Cardbacks for use at America's Cardroom to share with the cardschat community. This is to prevent the client from updating and overwriting your mods everytime you close the client. A back-up of this file with instructions is included and can be used to update the client periodically. Please do not attempt to install this mod if you do not have basic computer skills. I have included detailed instructions, as well as a video of the install for windows10 in the download package. nice job!!! and then you can see all the cards, huh? just kidding, it really looks nice. Very nice job! I will check it out as soon as I get home. C:/AmericasCardroom/images/game/themes/fronts/4color/set2 (or whatever ones you want to replace..